These words denote a belief system that Reuben Forsland understands completely. He’s not a musician though, he’s a luthier—and a luthier, in case you didn’t already know, is a person who makes stringed instruments. Forsland doesn’t just make acoustic guitars, though, he makes one-of-a-kind works of art that any musician would be proud to own. Forsland, 40, hasn’t always built guitars, but it seems like he’s always been building something. So early this year, Forsland began working full time out of his shop, creating his custom guitars. It’s a leap of faith, but it’s what he believes he should be doing. And it’s a good thing Forsland has decided to make his guitars full-time, as it’s an extremely long process to transform sheets of wood and guitar strings into a beautiful and functional work of art. For example, it took Forsland three years to find the right piece of Brazilian tulipwood for his guitar called Spring. Right now Forsland is waiting for a piece of wood from a tree up in Alaska that was carbon dated to be almost 3,000 years old. This wood will form part of a guitar Forsland will call the Ancient Earth Guitar. Forsland will also use wood from an I-beam from Mozart’s house for his guitar he plans to call Love, and an historical piece of wood from a tree that stood near a civil war hospital for the guitar which will be called War. In addition to the wood, Forsland finds other ways to make guitars that are truly unique. “I put items in my guitars that are very interesting, like fragments from the Hawaiian ram’s horn, a walrus tusk or even a narwhal tusk,” he says. Forsland also makes each guitar a story onto itself. “Every guitar has a name,” he says. “And each guitar suits its name in every way—from how it looks to how it sounds.” For example, the guitar called Winter is made from grey wood and it has a cold, crisp sound. Forsland also adorns his guitars with designs that match the theme of each guitar. For example, the top of the guitar named Water has an inlaid design that looks like waves. Forsland uses precious stones and local materials such as crushed oyster shells to create these designs. One local musician Forsland has worked with is Des Larson. “I saw him play one night and I thought, ‘This guy is amazing—his playing style and stage presence… wow! I need that guy to play one of my guitars.’ Eventually, we hooked up and Des became the owner of one of my guitars. It’s called Wind and it’s perfect for him because he’s always blowing around from place to place,” he says, laughing. After a musician has purchased a guitar from Forsland, the relationship is not over. “I like to take care of musicians,” he adds. “After a musician has purchased a guitar from me, I make sure they’re taken care of string wise.” Forsland goes on to explain that guitar strings should be replaced at least once a month, so his ongoing commitment to his clients is no small thing. 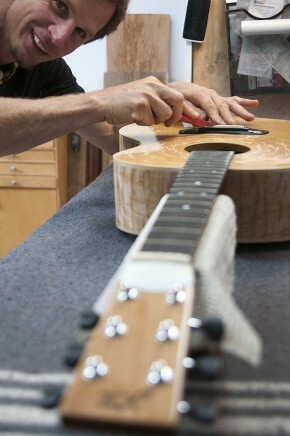 In addition to building custom guitars, Forsland also rebuilds and repairs existing guitars. He will also make custom guitars for customers who have special objects or stories they would like within the guitar. To Forsland, his guitars are more than just a way to make a living—they are works of art. You are out for a pleasant stroll in one of our neighboring forests here on Vancouver Island and you are set upon by a cougar. And it might be noted that a cougar encounter is more likely on this lovely island than it is anyplace else in North America. It might also be noted that if you think you can outrun this huge feline (the largest species on the continent) then perhaps think again. Cougars can charge at a rate of more than 70 kilometres an hour. These are just a few of the findings unearthed by Comox Valley author, Paula Wild in her latest book: The Cougar: Beautiful, Wild and Dangerous, which was published this month by Douglas & McIntyre. 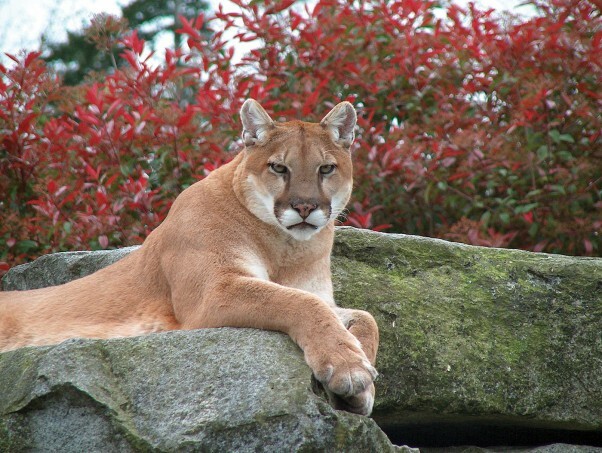 The cougar is a magnificent beast found throughout North America and goes by many names such as mountain lion, puma, panther, catamount and has a place of honor at the top of our forest food chain. So, why cougars as a subject for Wild? A couple of reasons, including their size and their beauty, but also because Vancouver Island is ‘Cougar Central’ for North America. Not only do we have the largest per capita population of the big cats, our home-grown are also the most aggressive of the species. Most of our forest species, grizzlies included, are relatively benevolent if left alone. Not so with cougars. If a cougar decides he or she is going to get you it will, for reasons best known to the cougar. In the 1990s there were more than 50 cougar attacks in North America and if the cougar does happen to attack, the hapless victim stands in great jeopardy. That is a greater number than all the years prior to that date combined. In other words, cougars are growing increasingly dangerous and Wild wanted to know why. Aside from the great speed of the animal when in attack mode, there is also its power. It was those realities that drew Wild to the work of Dave Eyer. That and the night she heard a cougar scream in the forest one night near her home north of Courtenay. It was a distinctive and rather frightening sound, and she became determined to find out all she could about the beast. That was what led her to Eyer. She contacted him after she’d read an article he had written on cougar safety. She asked if he had ever considered writing a book on cougars. “He suggested that I, as professional writer should do the book, and that was how it all came about,” she says. That launched an intense two-and-a-half year journey of interviewing scientists, wildlife officials, zookeepers, cougar hunters and people who have shared their homes with cougars. Wild also took Eyer’s two-day safety and awareness course that involved mock encounters with life-size cardboard cutouts of cougars charging at that aforementioned 72 kilometres per hour. In the process of her research she found that cougars once existed from the Yukon to the tip of Patagonia. They are now predominantly in the western US and Canada, but in the past decade they have started to migrate eastward, and one has been found as far east as Connecticut. She also learned that in 200 years there have been 255 attacks on humans, with 89 in BC—50 of those 89 attacks on Vancouver Island. The big cats, she says, are attracted by motion, so it will do you no good to try to outrun a confronting cougar. She notes that it is widely believed that children are the most vulnerable but that’s not so. While children are often killed when they are attacked, it has been found that in surveyed incidents of attacks over a 200-year period—from 1812 to 2012—58 per cent of all cougar attacks have involved adults. A couple of other protections Wild advises might be prudent to carry when venturing into the woods—including woods close at hand, not just in uncharted wilderness—would be bear spray and a shrill whistle. She always carries one on a toggle around her neck. The huge numbers of deer in the area attract cougars. “And be prepared to blow that whistle long and hard—that can be very effective in making the cougar think twice about attacking,” she says. Despite the proliferation of cougars on the Island, most people, including those who spend a lot of time in the forest—herself included—have never actually seen a cougar in the wild. “But, because you haven’t seen one, it doesn’t mean one hasn’t seen you,” she says. “They often watch people quite undetected. So, why is it that our cougars thrive and why are they so cranky and potentially dangerous. There are reasons, Wild says. But, Wild fully believes we need our cougar population to maintain a vital balance in nature. They keep the deer population under a certain amount of control and communities must also be aware that resident deer populations attract cougars. “At the same time we need to be realistic,” she says. “People get upset when cougars are killed when they venture into populated areas. We may try to use the argument that they were here first. Fair enough. But, we’re here now and have to act accordingly when dealing with such a dangerous predator. In that context Wild has included a chapter on cougar hunting and such old-fashioned cougar hunters as the legendary Cougar Smith of the Comox Valley and Cougar Annie. She says that although she kept journals all her life and had always harbored aspirations to be a writer, she didn’t activate that drive until she was in her late 20s. In pursuit of that objective she attended North Island College, took numerous correspondence courses and attended a week long writing workshop at Strathcona Park Lodge. Aside from her published books, Paula has also worked as a freelance writer for educational, corporate and government agencies. She is also a regular arts and culture feature writer and reviewer for the Comox Valley Record. She loves being a writer and is accepting of the good and bad aspects of a challenging business. These are just a few of the findings unearthed by Comox Valley author, store Paula Wild in her latest book: The Cougar: Beautiful, Wild and Dangerous, which was published this month by Douglas & McIntyre. For many people, prostate a pumpkin has one singular purpose—to be carved as a jack-o’-lantern, find displayed on Halloween night then promptly forgotten and left in a heap on the compost pile. Such a waste, since pumpkin has many other uses and benefits—from its recent use as an ingredient in beauty products to the traditional pumpkin pie that is enjoyed around the world. Large, round, orange and very recognizable, the pumpkin is a member of the cucurbit family, which also includes squash, marrow, melons, cucumbers and ornamental gourds. Pumpkins and squash are native to the Western Hemisphere. There is evidence of squash being eaten in Mexico as far back as 5500 BC and in South America more than 2,000 years ago. They were grown and eaten by the Indians of North and South America, who followed traditional methods of planting corn, beans and squash. In North America, fields were laid out with checkerboard accuracy, a mound of earth heaped up in every square. There were no draft animals in North America before the Europeans came—all land clearance and mound-making was done by hand, with the help of axes and stick and with hoes whose blades and points were made of wood, sea shells, antlers, and the shoulder blades of large animals. The women did all of the agricultural labor once the fields were prepared, and they took to the fields to plant these three vital crops. They poked holes into the mounds, and dropped seeds into them—four or six of maize and shortly thereafter, a few of beans, a few of squash. Corn, beans and squash were always eaten together and always planted together. In Iroquois myth, they were represented as three inseparable sisters. When the plants emerged from the hill, the corn grew straight and strong, the beans climbed the corn, and the squash plant trailed down the side of the hill and covered the flat land between the mounds. The spreading squash plant helped keep down the weeds. The Indian tribes who planted their seed in spaced hills zealously guarded the soil all around each hill from weeds. The first Europeans to see this marveled at the revelation of this novel neatness, and at so much willing hard work. They were also staggered by the size of the maize plantations. Diego Columbus, Christopher’s brother, said he walked 29 kilometers (18 miles) through an immaculate field of corn, bean and squash mounds, and never came to the end of it. The Indians in South and Central America still continue to grow beans up their cornstalks, and still keep down the weeds by growing pumpkins and squash between the stalks. By the 17th century, pumpkins were being widely used for pies in England and this trend continues to this day. Most varieties of pumpkins and squash are interchangeable—even in pumpkin pie, although now there is a small pumpkin called a sugar pumpkin that is perfect for pie, having a denser, sweeter and less watery texture. The only exception is spaghetti squash, with its uniquely textured flesh. 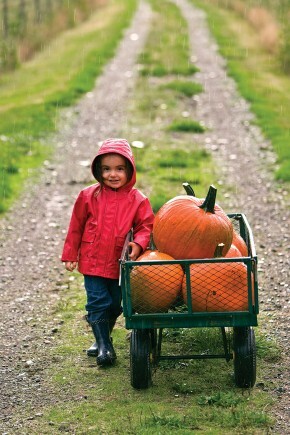 When the Colonists landed in North America, they found the Indians growing and using pumpkins. This large fruit was enthusiastically embraced by the new Americans and, subsequently, pumpkin pie became a national Thanksgiving tradition. 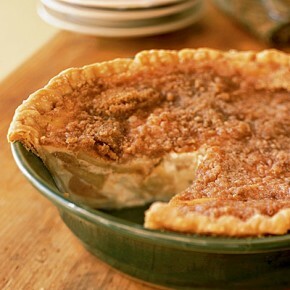 It was so loved that one early Connecticut colony delayed Thanksgiving because the molasses needed to make this popular pie wasn’t readily available. Squash comes in many different shapes and sizes. In 1824, reference was made in a book of the time to a pumpkin weighing 245 pounds. There are two sorts of squash—the summer and the winter varieties. The summer squash does not store well and matures earlier. It can be completely eaten when young, seeds and skin as well as the flesh. Zucchini, Chayote, Patty Pan, Straightneck and Crookneck squashes are all summer squash. Winter squash, with their hard shells and darker, tougher flesh and seeds, are harvested at maturity, and are one of the best vegetables to store for a long period of time. They have a higher nutritional value and are richer in complex carbohydrates and, in many cases, beta carotene. Again, there are many varieties—Acorn, Banana, Buttercup, Butternut, Hubbard, Spaghetti, Turban and Golden Nugget to name a few. Pumpkins also fall into this category. Winter squashes are almost always cooked, but usually only the flesh is eaten. The discarded seeds (especially from the pumpkin) can be toasted and eaten for a special treat. And just when you thought you had heard of all the different ways to prepare squash and pumpkin, along comes a study from Arizona that recognizes the value of pumpkin in an entirely new way. It seems pumpkin contains more than 104 nutrients, which beauty companies hope can be used to reverse the signs of aging. There are now pumpkin-based products including eye make-up remover, pumpkin peel mask, massage oil and several moisturizers. So, instead of tossing out the jack-o’-lantern after Halloween this year, try cutting the pumpkin into pieces and steaming it until cooked, scoop out the filling and mash it up. Add a dash of apple cider vinegar, a spoonful of plain yogurt, a sprinkle of cinnamon and ground cloves, the oil from two Vitamin E capsules and mix together. Spread over the entire face and leave on for about 10 to 15 minutes, but don’t answer the door—you may scare someone away who thinks you’re still celebrating Halloween! displayed on Halloween night then promptly forgotten and left in a heap on the compost pile. since pumpkin has many other uses and benefits—from its recent use as an ingredient in beauty products to the traditional pumpkin pie that is enjoyed around the world. a pumpkin has one singular purpose—to be carved as a jack-o’-lantern, displayed on Halloween night then promptly forgotten and left in a heap on the compost pile. a pumpkin has one singular purpose—to be carved as a jack-o’-lantern, thumb displayed on Halloween night then promptly forgotten and left in a heap on the compost pile. Preheat oven to 425°F. Cut the pumpkin and squash in half (lengthways) and scoop out the seeds. Peel the sweet potato, and cut into large chunks. Place the pumpkin, squash, sweet potato and a halved onion in a roasting pan. Be sure to cook the pumpkin and squash skin side down. Drizzle with a little oil and sprinkle with salt. Bake for 55–60 minutes or until the pumpkin, squash and sweet potato are just soft and starting to brown. Meanwhile, slice the leek into 1/4 inch rings, and wash thoroughly. Heat a large pot on medium heat and sauté leeks in a little olive oil. Once leeks are soft, scoop the roasted pumpkin and squash away from the skin and add to the leeks, along with the sweet potato and onion. Add 1 cup of the chicken stock at a time and blend until smooth with an immersion blender. If mixture is too thick, add remaining stock. Season with curry powder and add honey. Place over medium heat until soup is heated through. Serve with a dash of cream. Combine 1/2 teaspoon salt, black pepper, and 1/4 teaspoon ground cinnamon; rub over pork tenderloins. Heat a large ovenproof skillet over medium-high heat. Add olive oil. Add pork; sauté 4 minutes on each side until browned. Remove pork, and reduce heat. Melt butter. Add apple slices and shallot to pan; sauté 2 minutes. Stir in maple syrup, lemon juice, 1/4 teaspoon salt, and 1/4 teaspoon ground cinnamon; cook another 4 minutes. Stir. Return pork to pan amongst apple mixture. Spoon sauce over pork. Place in oven and roast at 425° for 12 minutes or until a thermometer registers 145°. Remove pork from pan; let stand 5 minutes. Slice pork; serve with apples. To prepare crust, roll dough into a 14-inch circle; fit into a 9-inch deepdish pie plate coated with cooking spray. Fold edges under; flute. Place pie plate in refrigerator until ready to use. To prepare streusel, lightly spoon 1/3 cup flour into a dry measuring cup; level with a knife. Combine 1/3 cup flour, brown sugar, and 1/2 teaspoon cinnamon in a medium bowl; cut in butter with a pastry blender or 2 knives until the mixture resembles coarse meal. Place streusel in refrigerator. To prepare the filling, heat a large nonstrick skillet coated with cooking spray over medium heat. Add sliced apple, 1/4 cup granulated sugar, and 1/2 teaspoon cinnamon; cook 10 minutes or until the apple is tender, sitrring mixture occasionally. Spoon the apple mixture into prepared crust. Combine remaining 3/4 cup granulated sugar, 2 tablespoons flour, salt, and eggs, stirring with a whisk. Stir in buttermilk and vanilla. Pour over apple mixture. Bake at 325º for 30 minutes. Reduce oven temperature to 300º (do not remove pie from oven); sprinkle streusel over pie. Bake at 300º for 40 minutes or until set. Let stand 1 hour before serving.